Home Quick Tips How to select all Unread Mails In Gmail ? Today we will discuss about how to select all unread mails in Gmail. 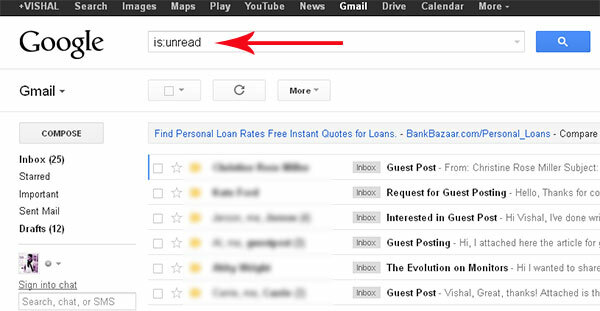 As you all know in yahoo mail, there is a simpler way to view all unread mails with just a single click. But in case of Gmail there is no such option to select all unread mails once. What if there are lots of e-mails in your Gmail Inbox and nearly a hundred more arriving every day, and you don’t end up reading them. This simple tutorial will tell you how to Select all unread mails. Step 1 : Log in to your Gmail Account ! Step 2: Now enter is:unread in the search box and select the Search Mail button. type just type in the search box, label:unread. I hope this trick will reduce a lot of work as many of us receive many emails a day. Just give it a try and let me know about your response. Drop your valuable comments here. thanks! Previous: Tips and Tricks for Sony Ericsson phones!